Baked Prawn and Pipi Parcels are easy to prepare and simply delicious. Perfect for a mid week meal or entertaining. Just don’t forget the crusty bread! 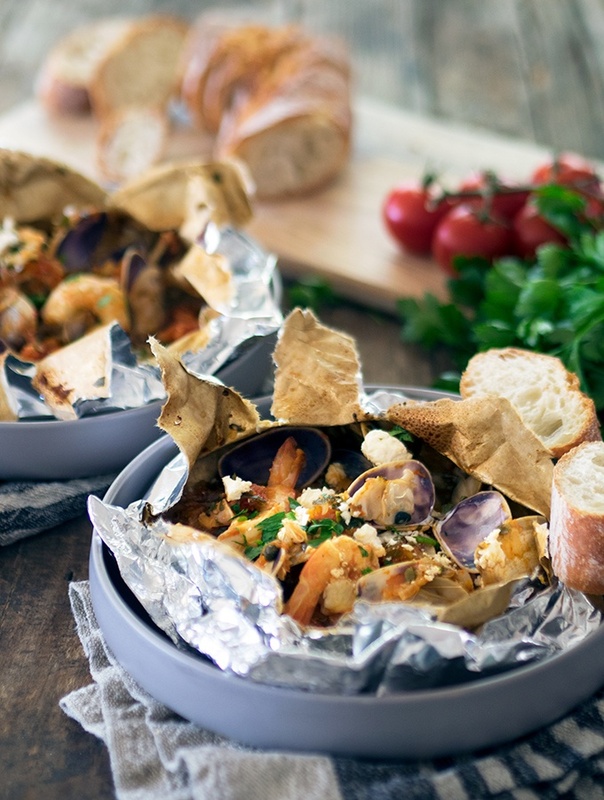 These baked prawn and pipi parcels are cooked in a parcel made from baking paper and aluminium foil. I find using foil with baking/parchment paper makes for easier folding and securing. Plus adds more strength to the parcel when baking. There is nothing new about baking a meal in a parcel. Traditionally you would use baking/parchment paper alone. I love the French word for cooking via this method, “en Papillote”. The English of “baked in paper parcels” doesn’t have the same ring. It even sounds far more exciting in Italian, “al Cartoccio”. But no matter what you call the cooking method, these baked prawn and pipi parcels are mighty tasty. When baking something in paper you are retaining all the flavour. The juices from cooking remain in the parcel. As the ingredients are cooked in an enclosed environment, all the aromatics in the steam are also retained. I have used the flavours I love with the prawns and pipis. I’m not sure if these baked prawn and pipi parcels fall into the category of Italian or Greek? It definitely falls into my taste bud category. With the use of tomato, anchovy, capers and wine, the recipe sways towards Italian. But then I add a generous amount of feta which then gives a saganaki vibe. They will only take 20 minutes to cook at most once in the oven. Even though the seafood is protected in a parcel be careful not to overcook. Being faced with rubbery prawns and pipis when opening the parcel would be such a let down. When opening the parcels be careful. All the steam will start to escape the moment you pierce that parcel. Use a knife and a fork to pry the parcel open, keep your fingers away, and be careful not to burn yourself. 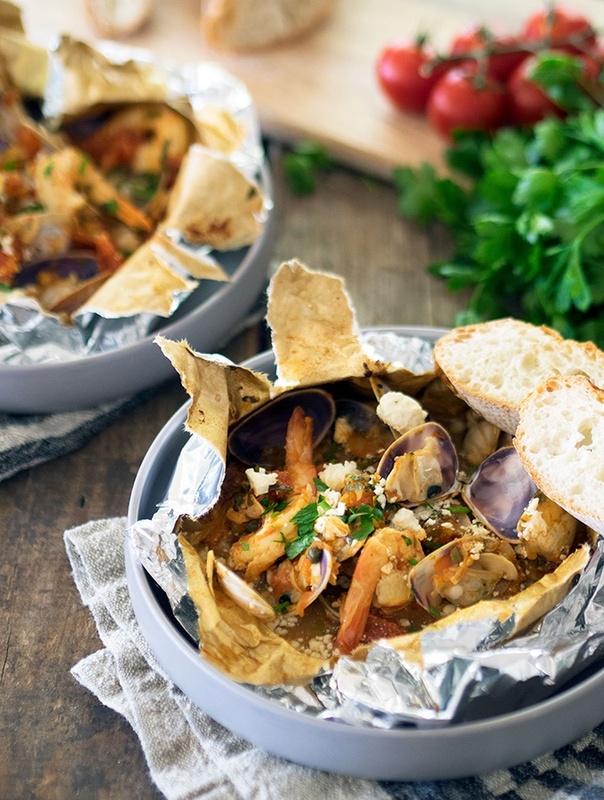 These baked prawn and pipi parcels are not complete without lots of fresh crusty bread. You will be dipping and mopping up that sauce, you will be in culinary heaven. There are special rolls of baking/parchment paper that you can purchase for the purpose of baking ingredients in parcels. The baking/parchment paper is backed with foil. It can be rather expensive to purchase, and if you have both aluminium foil and baking/parchment paper, this will do the same trick. Pipis are a bivalve mollusc also known as Coorong Cockles and are native to Australia. They are small clams, and if you don’t have pipis where you are located you can substitute small clams. What to do with any leftovers? 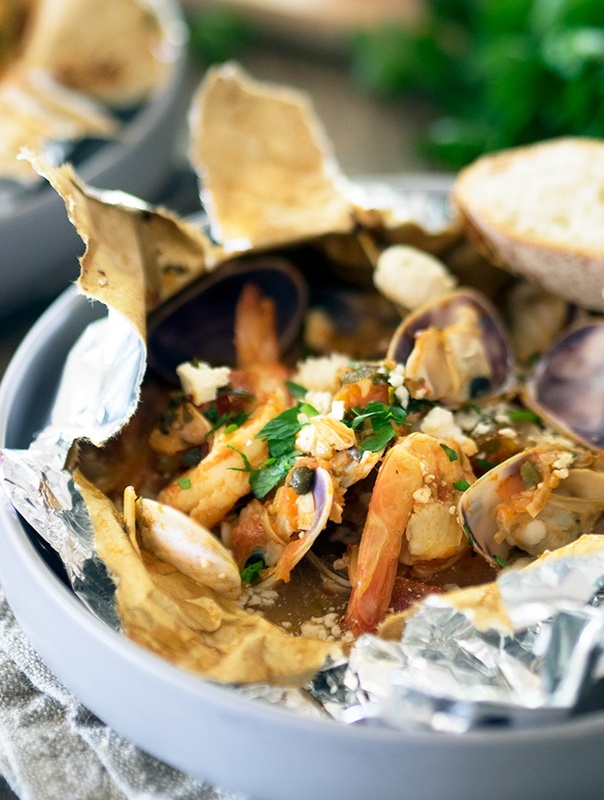 Due to the nature of this recipe and the delicate seafood, I suggest eating this as soon as it is made. I doubt that will be a problem, it really is a yummy dish. Any leftovers can be kept in the fridge and enjoyed the following day. This recipe is not suitable to freeze. Remove skin from tomatoes by cutting a shallow cross through the skin on the bottom of each tomato. Then plunge them into boiling water for 40-60 seconds. Remove with a slotted spoon, and plunge into iced water to cool. Once cool to handle peel off skin, and then roughly chop the tomatoes. In a heavy based non stick saucepan heat olive oil over a medium heat. Add eschallots and garlic, sauté until soft. Add tomatoes (and any juice), capers and anchovies. Stir and remove from heat after 30 seconds. Tear off 4 large pieces of baking paper and strong aluminium foil. Make the pieces of baking paper slightly smaller than the aluminium foil. Lay the four pieces of aluminium foil side by side on your kitchen bench. Then place a piece of baking paper on top of each foil piece. The foil and baking paper sheets need to be large enough to wrap your ingredients . 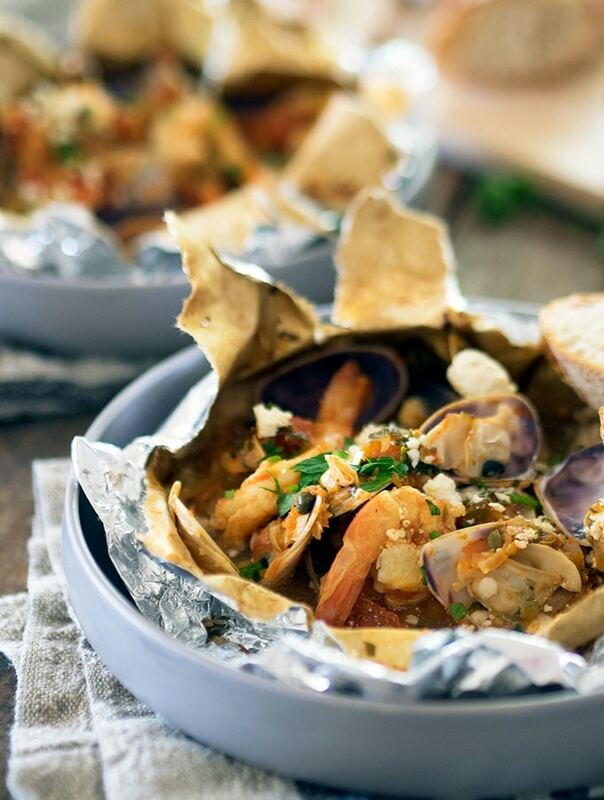 Place an even amount of prawns and pipis on top of each sheet of baking paper. Then evenly distribute tomato mixture over the four portions of prawns and pipis. Add a good splash of a dry white wine to each portion and then sprinkle with a little salt and cracked pepper. Sprinkle each portion with a ½ tablespoon of chopped parsley. Crumble 50g of feta over each portion. Close up each prawn and pipi parcel securely, ensuring that steam and liquids can’t escape. This is where the aluminium foil will aid in securing your parcels. Place parcels on a baking tray, leaving enough room around each parcel for air to circulate and cook your parcels evenly. Place baking tray in the oven and cook parcels for 20 minutes. Once cooked place each unopened parcel in a serving dish and serve unopened. Allow your guests to open their parcels and watch the steam escape and enjoy the delicious smells released. Serve with lots of crusty bread to mop up all those glorious juices! If the pipis haven’t been purged then you will need to, and it is easy to do so. Place them in a solution of tap water and sea salt (30g salt/L water). Leave pipis for several hours or over night in a cool place. Do not put in the fridge as the cold will make them close up and not purge the sand into the water. Wow this is a really interesting seafood salad. I stick to mostly fish and shrimp. Sometimes do crab. This one has more than what I normally try. Wondering it would be ok to use apple cider vinegar in it? Hi Roxana, it’s not a salad so probably why it is an interesting one 😉 As it is a baked dish with white wine, tomatoes etc, I wouldn’t be adding apple cider vinegar as it will throw off the flavours. Wow, this is amazing! Shrimp is my fav, I so want to make this…Pinning! I love shrimp too, glad you liked the recipe. I love baking in little parcels of foil like this! This sounds like the perfect combo and reminds me of a seafood stew! Karen you are so right, it really is like a seafood stew. These look delicious and they just scream summer. I love anything with feta in it. This one is just as great for winter too as it is baked. But seafood always says summer to me. I love how many flavors this has!! Sounds delicious! Thanks so much Mindy, it is quite delicious.